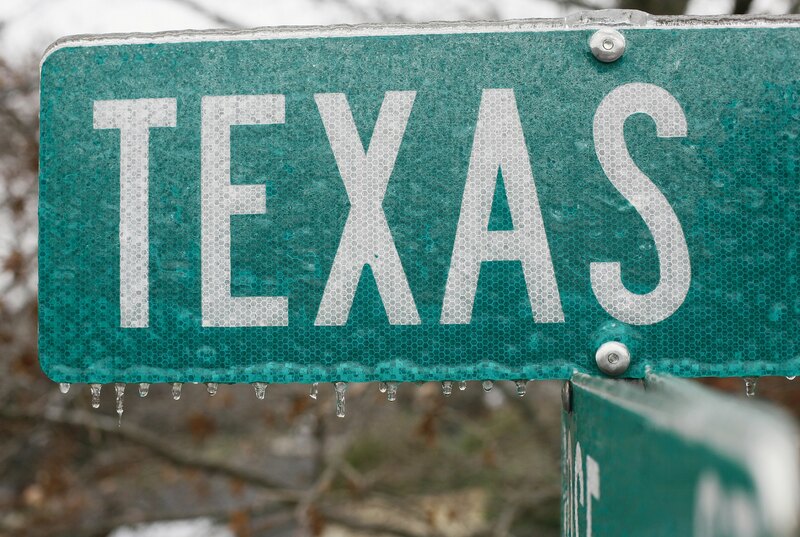 A Texas ice storm is causing major trouble for the U.S. Southwest this week. On Monday, the state reported that the winter storm, which blanketed the Dallas-Fort Worth area in swaths of freezing rain, had left behind heavy sheets of ice on roads, power lines, and walkways, causing thousands of power outages and traffic accidents, and bringing business as usual to a grinding halt. Officials from the Dallas-Fort Worth airport also reported that over 1,000 inbound and outbound flights had been canceled, stranding travelers and causing massive delays across various parts of the country. By 12 p.m. CST, local police in Carrollton, which sits around 20 miles north of the Dallas metropolitan area, had reported one fatality after a car lost control and crashed into the rear of an 18-wheeler. Because of the hazardous conditions, school officials at the Dallas Independent School District, Southern Methodist University, the University of Texas at Dallas, and Texas Christian University announced that they would be canceling classes as well. The ice storm has also caused delays in the highly publicized murder trial of American Sniper subject Chris Kyle's alleged killer, Eddie Ray Routh. Closing arguments in the case against Routh, who stands accused of shooting Kyle and friend Chad Littlefield on a gun range outside Fort Worth, had originally been scheduled for Monday, but were pushed back to accommodate the inclement weather. As the region braces for yet another winter wave on Wednesday, which the National Weather Service has reported will dump around three inches of snow on the already slippery roads, police have begun issuing warnings to commuters, indicating that while the ice has begun to melt in some areas, the slush mixture currently coating roadways will most likely freeze overnight. "[Traffic] is moving,” said trooper Fred Biddle of the Department of Public Safety in Fort Worth, in a comment to The Star-Telegram. “We don’t recommend travel but it is moving. I just worry what’s going to happen later after dark when all of this stuff refreezes." In keeping with their counterparts in the U.S. Midwest and Northeast, many Twitter users have taken to social media to vent their frustrations and try to put a positive spin on the miserable weather that's keeping them cooped up inside. The winter storm has caused calamity in other parts of the south as well: Emergency Management Agency officials in Tennessee recently announced that icy conditions left 22 dead, and authorities in Kentucky reported an additional 11 fatalities since the storm first hit on Feb. 16, according to a report by Reuters, but for now, residents in Texas are keeping their chins up and bracing for the next round of cold.